In 1967 I received a Bachelor's of Science Degree in Biology and Chemistry from Northern Illinois University. Following my undergraduate work I was awarded a U.S. Public Health Service grant to perform post-graduate research on cell wall structural chemistry at Arizona State University. Following the completion of that work I taught biology at Midwestern U.S. middle and high schools for the next 8 years. I went on to manage training, infectious disease clinical research and quality control at Abbott Laboratories in the Chicago area for the next 30 years. From 2001 until my retirement in 2005 I served as the Senior Quality Manager on the company's Corrective Action and Review Board which, on a daily basis, made major decisions regarding the fitness for use of Abbott's medical diagnostic products. In 2005 I retired and moved to sunny Las Vegas where I am now very happily married to the love of my life, Carol. 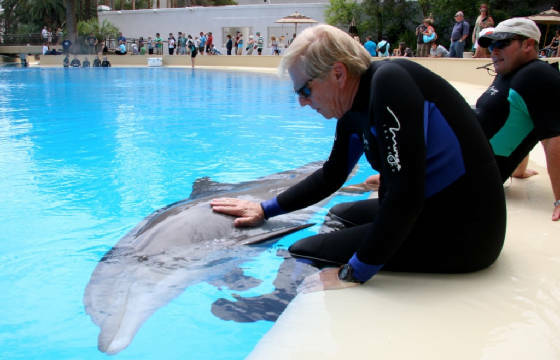 From 2008 to 2010 I worked at a major Las Vegas Strip property as a dolphin facility VIP Tour Guide and Educator. 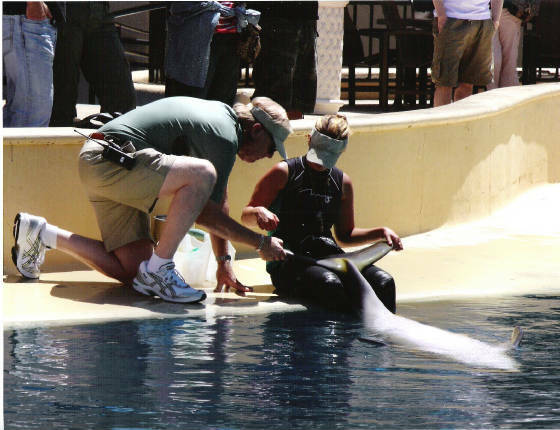 Although I was not a dolphin trainer, I was occasionally offered the opportunity to assist the trainers in their work and have provided support to this dolphin facility as an education program consultant. I have produced this web site in an effort to advance the understanding and promote the conservation of the beautiful animal called the Atlantic Bottlenose Dolphin.